Colin reached out to me over Plentyoffish. His profile read like a conspiracy theorist's treatise but he somehow or other charmed me into a date. We met in a park and as we walked the conversation inevitably turned to his favorite tinfoil hat theories. He had a lot to say about President Obama that I won't repeat and then finally asked, "Did you know 9/11 was an inside job?" I must have rolled my eyes when I said, "I've heard that." He said, "I know who was behind it." He shouted, "Me!" in my face and then took off at a full sprint across the park and out of my life forever and ever and ever. I think you mean "attest" and not "contest". 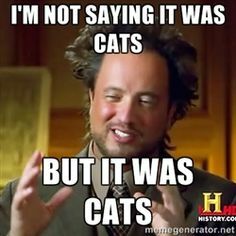 I went on a date who insisted that all of the "ancient alien civilization" theories were completely true, 9/11 was an inside job, New World Order, and all the rest. That was a lot of crazy packed into one guy. I'm surprised he didn't wear his good tinfoil hat on the date. She somehow charmed OP into a date? Come on, you just wanted to have a laugh at his expenses, admit it! Yeah, I heard his expenses were pretty terrible. Can't stand a guy with too many bills to pay. Gross. What if the gentleman in question has the skillz to pay said bills? I would think that would be an attractive quality in a potential mate. :-p Well, he probably spent much in tinfoil and in buying dodgy DVDs from the thruther movement... That's well plenty to laugh at. Oh yeah? 7/11 was a part time job! My favorite response. I give that joke a solid 5/7. Damnit, that would have been a better joke. Point to Steve. SO the dude was nuts, but you still gave him a chance, expecting different results? Bananas, did you write this? While I do typically give conspiracy theorists a chance, (it's the dedication to detail. yum.) I don't approve of yelling in people's faces. Rude. OP forgot to admit to being on the grassy knoll, faking the moon landing and area 51. Oops, I meant OP's date.